LG today announced that it has sold one million of its GD510 Pop touchscreen feature phones in just 100 days. The Pop sports a 3-inch WQVGA display, a 3 megapixel camera, and can be purchased with an optional solar charger. LG will release the Pop in two new colors, aqua blue and lime, next month. LG credits simplicity for the phone's success: "LG Pop offers most of the benefits of a smartphone without the steep learning curve. There's still a huge market out there for phones that do everything right out of the box," said Dr. Skott Ahn, president and CEO of LG Electronics Mobile Communications. Apple iPad pre-orders to start February 25th? Apple rumor blog Appadvice is predicting that Apple will begin accepting pre-orders for the Wi-Fi-enabled iPad starting February 25th. This isn’t confirmed as Appadvice does not mention any source for this information and it has previously made predictions that have turned out to be false. Most notable is their prediction of an iPhone 3GS with an OLED display and FM transmitter that never panned out. Nonetheless, a pre-order commencing about a month before the shipping date promised by Steve jobs is not out of the realm of possibility. We won’t pull an all nighter, continually refreshing the Apple Store web page but it is worth a casual glance come Thursday morning, no? Although we fear the only people who will buy a phone with a projector built into it are the same jackasses people who bring laser pointers into movie theaters, we have to admit the Samsung i8520 Beam is pretty darn cool considering the DLP Pico projector is actually built into the device and not some crappy add-on. But of course, no novelty feature can help a phone’s sales if the rest of it isn’t up to snuff, though it looks like the i8520 has enough packed into its 14.9mm thin frame to get the geek juices flowing: a 3.7″ WVGA Super AMOLED display, 8 megapixel camera with auto-focus and flash, aGPS, Wi-Fi, DNLA, 7.2Mbps up HSDPA (900/1900/2100MHz), 16GB of internal memory, 512MB ROM / 384MB RAM and an 1800 mAh battery that is said to yield 7 hours and 50 minutes of 3G talk time. OS wise, the i8520 is running Android 2.1 with “Specialized Projector UI”, something which is identical to the bada interface. No word yet on what processor we’re dealing with, although we have fired off an email to Samsung PR. The Samsung i8520 Beam will be available in Europe and Asia starting in Q3. 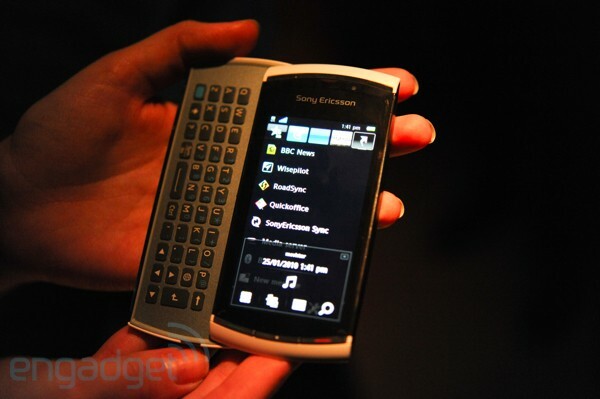 It kinda got buried beneath the X10 mini and mini pro, but Sony Ericsson went ahead and threw us a Symbian-flavored bone this evening with the Vivaz pro. The phone's nearly a dead ringer for its non-pro doppelganger -- the original Vivaz -- but it adds a claimed 2 millimeters of thickness, which we found to be nearly imperceptible when you're holding it or gazing in its direction. We'll admit this is a better looking phone (along with the Vivaz) in person than we'd figured from the press shots, but we're still not sure we'd buy in -- the UI feels a little bit like a warmed-over S60 5th Edition, unlike the X10's thorough reworking of Android. If anything, this could very well be an N97 mini killer, especially considering the keyboard's decency -- just check out that centered spacebar. They’re back at it again. The iPhone dev-team has released an update to their popular jailbreaking software, PwnageTool, for Mac OS X. The new PwnageTool — version 3.1.5 — boasts the ability to properly jailbreak Apple’s recently released 3.1.3 iPhone/iPod Touch firmware. Before you get too excited, the dev-team does offer up this proclamation, “Unless you’ve personally observed a problem with the reporting of your battery percentage, there’s no reason to update to 3.1.3.” For those that feel the need for a jailbroken iPhone or iPod Touch with the 3.1.3 firmware follow the read link; let us know how it goes in the comments. The Bluetooth Special Interest Group recently approved a ZTE phone with Verizon branding on it. This would be the first ZTE phone picked up by Verizon if it goes on sale. The SIG's documents confirm the ZTE phone has CDMA 1x and Bluetooth radios, as well as a camera and voice controls. The ZTE F350 has not been announced. ZTE is a cell phone and equipment manufacturer based in China. Canadian Android aficionados who wait with bated breath for TELUS to release the Motorola MILESTONE might soon be able to breathe easy if a new rumor has any truth to it. According to the folks over at MobileSyrup, TELUS recently sent out a memo its employees that the MILESTONE will make its debut on February 18th with pre-orders at Best Buy starting as soon as the 5th. Pricing wasn’t mentioned, but it’s looking as if the MILESTONE start at $199 and max out at $549 without contract. Pretty damn tempting, eh? While much of the tech world continues the stupid debate as to whether or not the iPad is the greatest thing to happen since electricity (it’s not), Verizon has quietly been shipping promo materials for the Motorola DEVOUR to retail outlets across the country. Granted, this hasn’t come out of nowhere considering the device showed up in CelleBrites as early as two weeks ago — plus, who could remember our not once, twice, but thrice photo sessions with it — but the funny thing is that a whole whack of support guides have just now gone live on Motorola’s global support site. Interesting, no?